This monument designed by Sir Christopher Wren was built to commemorate the Great Fire of London 1666 which burned for three days consuming more than 13,000 houses and devastating 436 acres of the City. The Monument is 202 ft in height, being equal to the distance westward from the bakehouse in Pudding Lane where the fire broke out. It took six years to construct 1671 – 1677. The balcony is reached by a spiral stairway of 311 steps and affords panoramic views of the metropolis. A superstructure rises from the balcony and supports a copper vase of flames. 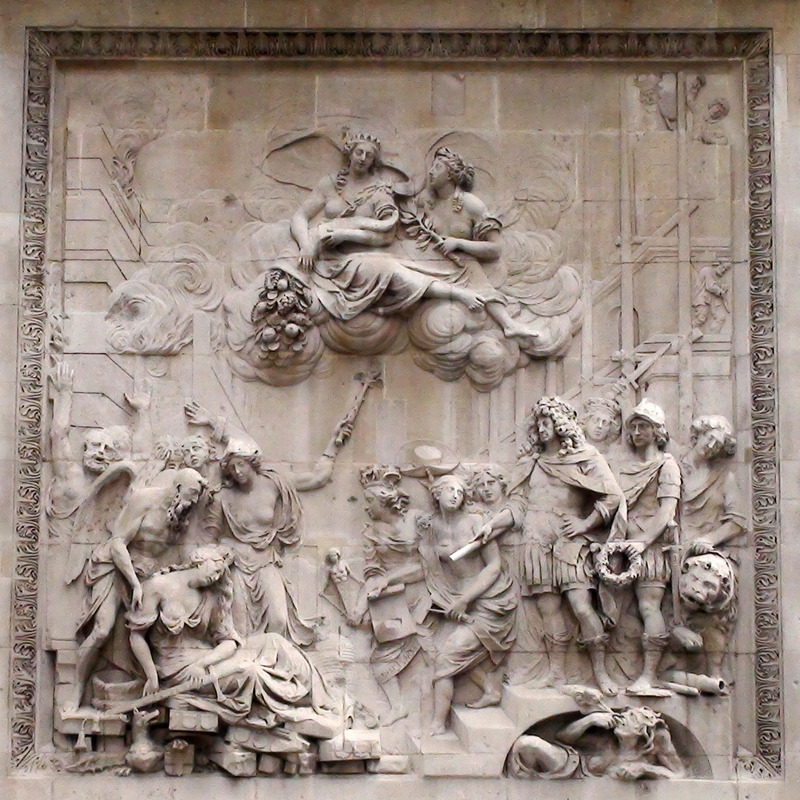 The allegorical sculpture on the pedestal above was executed by Caius Gabriel Cibber. St Magnus the Martyr Fish Street Hill to the south leads to St Magnus the Martyr (a Wren church) alongside which is the ancient footpath which led to the first London Bridge. * These last words were added in 1681 and finally deleted in 1830. 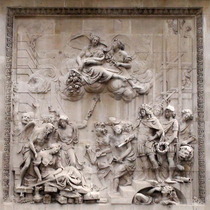 The bas relief by Cibber is worthy of close examination. It shows a woman on the left (representing the City) languishing on some ruins. Winged Time supports her and a female figure points with a winged sceptre at the clouds which contain two more bare-breasted lovelies, one with a cornucopia (Plenty) and one with a laurel branch (Praise). Behind the group on the left are some figures waving their hands in distress and behind them, the cause, buildings with smoke and flames pouring forth. To the right of this group can be seen a beehive, symbol of industry. And is that the City dragon/griffon we see at the bottom left creeping out from under the ruins? The main figure in the group to the right is King Charles II standing at the top of some steps. He directs three more scantily-clad women down the steps towards poor City. They represent: Science brandishing a figure of many-breasted Nature and with a very strange headdress; Architecture clutching some plans and a pair of compasses, and Liberty waving her cowboy hat in the air. To the right of the Kings stands his brother, the Duke of York (the future King James II) clutching a garland, presumably destined for the City. Behind James are two more female allegorical figures: to the left Justice wearing a coronet and to the right Fortitude brandishing a sword in one hand while the other controls the leashed lion at her feet. Behind this group the reconstruction of the City progresses, with workmen scrambling over scaffolding. Below the steps on which this group stands, squeezed into an arched cavern is an ugly female figure, Envy eating her own heart. Built 1671-7, designed by Christopher Wren and Robert Hooke as a monument to the Great Fire and as a scientific instrument. Each step is exactly 6 inches high. The very top of the edifice has a hinged lid and the spiral staircase surrounds a void (rather than a solid shaft) so the whole height can be used by a giant pendulum, or as a telescope, or (and who does't want to do this?) for dropping things. 'Hooke’s laboratory' is a room below ground not normally open to the public but Londonist (who have an 'access all areas' pass) have been there. The column is 62m high, and it stands that same distance from the supposed site of the start of the fire. The column stands on a plinth, three faces of which carry Latin texts with translations. This all amounts to a lot of text but the inscriptions are not very photogenic so we have treated each pair of faces as a memorial: west and north together, east and south together. In all this verbiage we draw your attention to the reference to "Popish frenzy" at the end of the (English version) of the inscription on the north face. This is explained at The Monument, which is an excellent resource. 2016: Great post from Londonist re The Monument suicides showing fascinating contempory newspaper reports with quite surreal drawings. In George Gissing's 1894 novel 'In the Year of Jubilee' a young man shows a lady, whom he does not know very well, around the City, in which he works, and takes her to the top of the Monument, where they enter into a sort of engagement, dependent on the success of his career. This cast-iron roundel is one of 22 - see Bowler's page for more details. Plaque unveiled on the centenary of his birth, plus 2 days.